If you are me, some mornings begin like this: you find yourself struggling angrily with your travel mug and then it turns into some hummunah-hummunah* realization. *Hummunah-hummunah is a sound effect a friend used to make to symbolize people who meditate. I don’t even know. You may even go through all 5 Kübler-Ross stages of grief. And then you have just the tiniest perspective shift – in this case it means peering closely at the cap and realizing it is, in fact, mostly shut and that you have been desperately suckling a closed coffee mug like a crazed calf for the last 10 minutes. You resigned yourself to uncaffeinated suffering, when really, all you had to do was turn the cap a few millimeters to let the sweet nectar flow. You guzzle your now lukewarm coffee, and you wax philosophical. 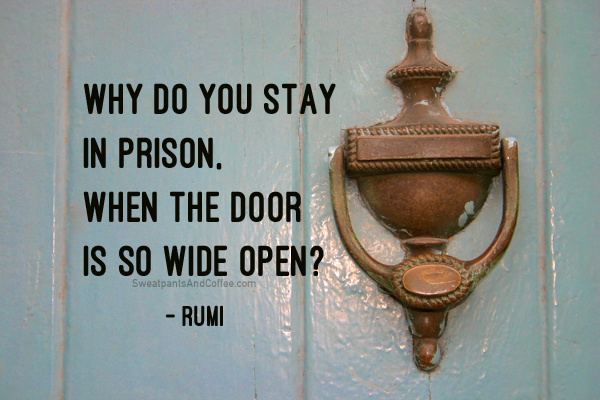 You think of Rumi and how he wonders why you stay in jail when the door is wide open. You think about how the sentence, “This is just the way I am” is a huge, steaming cop out, because of course people are who they are. But why should that mean they are incapable of growth? Of change? Can we not, at any moment we choose, turn the metaphorical cap? If you watch the news this week (any week, really), you see a never-ending tickertape of despair and hatred. You see everything that is broken and divisive. You see cruelty and ugliness, and they are so big that it seems like the only thing you can do about it, maybe, is rail against it on social media. Take that, bastards. Feel the wrath of my scathing Tweets. You get in arguments with strangers. You DARE people to unfriend you, because good riddance. You disperse your anger, aerosol-like, into the ether. You’re still mad and sad and empty. If you had my day yesterday, you might have had a really hard time loving the world. You might have struggled to accept that everyone around you is just doing the best he or she can, and that sometimes their best is not enough for you. You might have decided that this is just the way things are, and that the way to cope is to either lower your expectations or give up altogether. You might have angry-cried in your car because, on top of everything else, your stupid travel mug wasn’t working. What if you decided to take a closer look and turn the damn lid? What if you decided that hope is as simple as trying one more time? All I know is, I can stay frustrated and rageful, or I can try to figure out what small thing I can do to be happier and more calm. I can pay attention to this moment, this body, this here and now. I can stop yelling at coffee cups and computer screens and focus on radiating compassion. It’s the only way I know to make the world better. 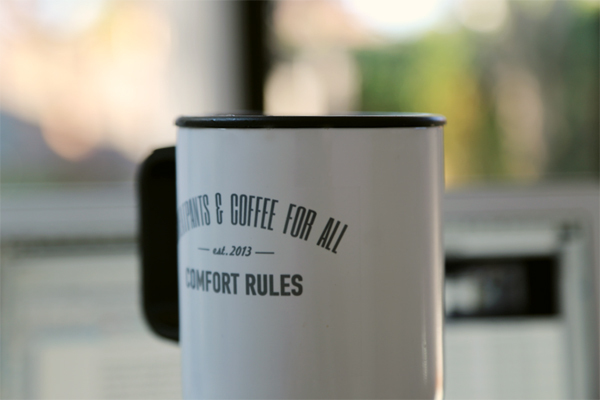 It starts within the small radius of space between my mug and me.